We have compiled a bibliography of 662 articles in marketing published in the EME specific context across 86 marketing journals during the period 1986-2011 and circulated in 2012 annual conference. Through the present exploratory study, our earnest intent is to collate all the EME specific research articles that got published in the marketing area journals during a period of 25 years, i.e. during 1986 to 2011. A list of 14 Master Keywords and 27 Allied Keywords have been generated for selecting and categorizing the research articles from the considered list of marketing area journals. A list of 86 peer reviewed international journals in marketing were shortlisted in May-June 2011 by referring to four widely known lists of journal ratings. These journal lists were: (i) Australian Business Deans Council (ABDC) journal list that carries a total of 117 international journals in marketing, (ii) Science Journal Ranking (SJR) that carries a total of 104 international journals in marketing, (iii) Major Marketing Journals (MMJ) that carries a total of 41 international journals in marketing, and (iv) Selected Marketing Journals (SMJ) that carries a total of 61 journals in marketing. The present compilation of the bibliography has yielded a precious collection of 662 theoretical and empirical research papers in the EMEs context, which were sourced from 86 marketing journals. Going by the track themes of the conference, we could find that the maximum number of articles in the present bibliography is in the area of International Marketing and Cross-cultural Issues (25.68%), which is followed by Product and Brand Management (10.73%), Emerging Issues in Marketing (9.97%), Technology, Innovation, and B2B Marketing (9.06%), Retailing and Retail Management (7.55%), Managing Marketing Channels (6.95%), Marketing Communications (5.59%) and Consumer Psychology & Behaviour (5.29%). No other conference track theme is found to have more than 4 per cent of the articles of the present bibliography. This indicates a significant trend in the EME based publications within the 86 considered marketing area journals. 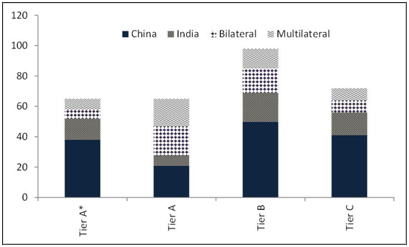 As indicated in Figure1.0, the highest number of referred research articles is published in the Chinese context (50%), which is followed by Indian context (18.33%) followed by bilateral (16.33%) or multilateral context (15.33%). 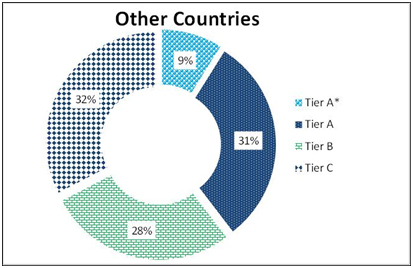 According to Figure 2.0, the distribution of articles referring to other countries (excluding China and India) and published in journals are mainly in Tier C and Tier A journals i.e. 32% and 31% respectively which is followed by Tier B 28% and last is Tier A* having only 9% of the articles. Referring to Figure 3.0, it has been found that 59.16 per cent of the articles in the present bibliography got published in the marketing journals during the period 2006-2010. Whereas this figure was 25.98% during the period 2001-2005, 7.8% during the period 1996-2000, 3.01% during the period 1985-1995. This publication trend across the marketing journals indicates the increasing significance that the EME specific research has achieved over the years. Maximum publications happened in last decade with numbers being more for the second half of the decade. As far as the data analysis techniques used by the researchers in the EME specific articles, most of the techniques were found to be in place while addressing the international marketing and cross-cultural problems. Elementary statistical techniques such as t-test, z-test, correlation, Chi Square test, and descriptive statistics were found to be the most frequently used techniques, followed by regression analysis, factor analysis, and experimental designs. There is growing interest in using advanced statistical techniques like Structural Equation Modeling in recent articles. Analysis techniques like conjoint analysis and time series analysis were found to be rarely used in the EME context. As indicated in Figure 4.0, International Marketing and Cross-cultural Issues is the most researched thrust area in EME context followed by product and brand management which is followed by Technology, Innovation, and B2B Marketing. Emerging Issues in Marketing is another thrust area which is given importance across journals. 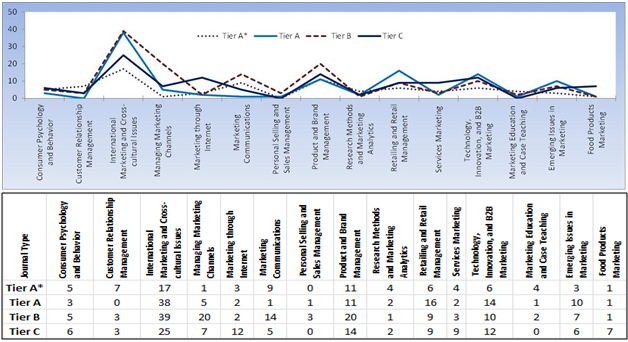 Referring to Figure 6.0, Managing Marketing Channels, Marketing Communications are other areas where articles in Tier B journals have focused. Tier C journals have focused on marketing through internet, services as well. Tier A journals also focused on Retailing and Retail Management making it yet another important thrust area in EME context. As depicted by Figure 5.0, Emerging market(s) is the most used keyword in the journal articles in the EME context. In Tier A journals emerging economies is the second most used word whereas in Tier C journals culture is the second most used keyword. There are some concerns too. The total number of research articles that got published during the past 25 years is relative small. Also, very few EME specific research articles were carried by the top-tier marketing journals. While Journal of Marketing carried 14 articles in the past 25 years, only 3 articles were carried by Journal of Marketing Research during the same period. The statistics with other journals were also found to be equally bad during the time span, 1986-2011.